To speak is silver, but to question is gold. As Denmark looks to the future, what questions need to be asked that are not being asked? What questions are being asked and not being answered? The Nikolaj Kunsthal in Copenhagen asks its public to submit questions, five of which will be chosen by the curators to be turned into AR artworks, an overlay of golden words visible in the display of a smartphone, surrounding the viewer and hovering over the live camera view of the surroundings. 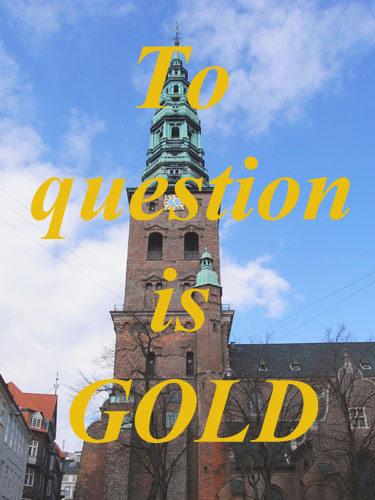 The questions will be viewable anywhere in Denmark. You need a late model Android, an iPhone4 or an iPad2. Start Layar, press the "Layers" button and search for "question gold". Select the layer to launch it. Look up and around for the questions! I would love to receive screenshots at: tamiko (at) alum (dot) mit (dot) edu. If it says "no content" please back out and try again, sometimes it takes a while for the Layar server to find you. If you see only 4 questions, or they are very small, also refresh or relaunch - especially Apple products take a while to calculate your correct GPS coordinate. How can Denmark balance solidarity and individualism? Will we soon be under water? Where have all the smiles gone? What comes after the EU? What will the past mean to us in the future? Why don't you smile some more? Are you happy with where you are now? Why don't you put down your phone and hug someone right now? What do you see around you and how does it make you feel? Why does Denmark have a monarchy? Are we losing our sense of community? Why does an egalitarian state have a monarch?